This page states the Terms and Conditions under which you may use FMA's website. The contents of the password-protected, Members' Only section of this website are solely for the personal use of current members of FMA. The usage of such materials for non-personal purposes is prohibited and usage for unapproved purposes may result in the suspension of an individual's login abilities. You do not need to request permission to create a text link from your website to the FMA website. FMA makes no representations about the accuracy, reliability, completeness, or timeliness of the material on this website or about the results to be obtained from using the website. Your use the website and its material at your own risk. Changes are periodically made to the website and may be made at any time. THIS WEBSITE AND ITS MATERIAL ARE PROVIDED ON AN "AS IS" BASIS WITHOUT ANY WARRANTIES OF ANY KIND. By using this website, you agree to defend, indemnify, and hold harmless FMA, its officers, directors, employees and agents, from and against any and all losses, claims, damages, costs and expenses (including reasonable legal and accounting fees) which FMA may become obligated to pay arising or resulting from your use of the site material or your breach of these Terms and Conditions. 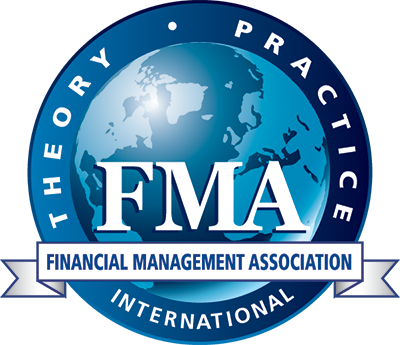 This site is maintained by the Financial Management Association International in Tampa, Florida, USA, and hosted by MemberClicks, Inc., a third-party data hosting service to help manage membership and contact information of individuals and/or entities for FMA’s unique business purposes. To access FMA's Social Media Policy, please click here.